Sitting outside the former home of Margaret Lynch Scott in New London, Connecticut, I feel odd, but dedicated to the mission. A large middle-aged man passes me on the sidewalk, glancing over at what I’m up to, as the bells of St. Mary Star of the Sea Church chime “Oh Come All Ye Faithful.” It’s late January, and I’m sitting on a collapsible stool, hunched over my sketchbook on a sidewalk in 50-degree weather, drawing an ordinary house, on an ordinary street. As I sit and draw, a man comes out of the house to get something from his pickup truck and double takes at me. That’s not uncommon. I wish to be invisible, but I’m not. A week earlier, a kid passed by me twice—the second time looking down and saying “That’s sick.” in reference to my upside-down drawing. Thankfully, nowadays that’s a compliment. 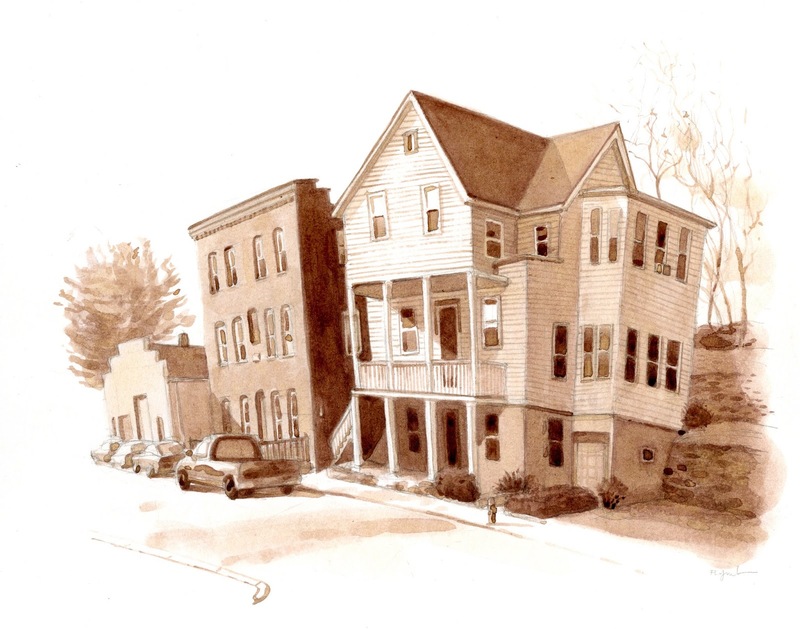 In this series, I’m finding, and visiting, and drawing the sites of my immigrant ancestors. I had no idea there were so many. And I’m being taken to places I’ve never been, even within areas where I’ve lived. Sometimes much has changed in a century and a half, and other times very little. I often find new immigrants living in the exact places my ancestors did, starting out just like my family—at the bottom. The large man returned a little later with a big bag of fast food under his arm. As he passed, he sang out “Artist on the job!” I like that. I sing it now and then to myself when I sit in strange places.